Order is one of the central themes of the book, Return to Order From a Frenzied Economy to an Organic Christian Society—Where We’ve Been, How We Got Here, and Where We Need to Go. It is the object of our return and therefore must be clearly understood. The word order can bring several things to mind. When items are in their proper place as perhaps in a closet, they are said to be in order. When some kind of discipline is applied, as in the case of law enforcement, the result is order. 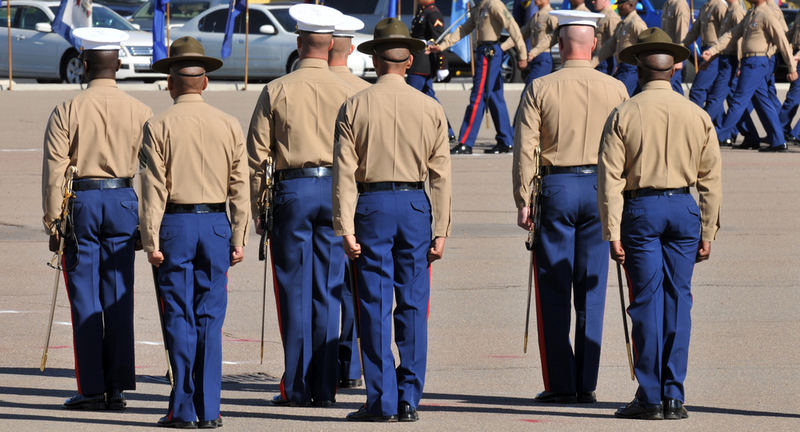 When Marine Corps Band executes a command from their officer, the parade is in good order. When something works, it is said to be in order. Before all else, everyone needs some semblance of order to function. No one can think clearly amidst confusion or chaos. Order allows one to get one’s bearings; one cannot live tolerably without it. It is that fundamental framework, which must be in place before anything of significance can be accomplished. To this first definition, we might add another: Order is that state of things where everything functions according to its end. When everything is doing what it is supposed to be doing, there is order. When, for example, all the organs in a human body are functioning properly, there is order. All it takes is one malfunctioning major organ, and there is disorder in the whole body. Applying this definition to the soul, we can say a person’s soul is in order when the intelligence, will and sensibility are working together as a whole toward a final end: the full development of a person’s talents and abilities and ultimately toward sanctification. What can be said about the individual soul can also be affirmed about society. Order is the first need of the nation. There must be a set of internal principles to coordinate the actions of men in society toward the common good lest it degenerate into chaos. Freedom, justice, or law are extremely important to a society. However, without a social order they become impossible to practice. Everything about life in common depends upon first establishing some semblance of social order. This order is like a light amid the darkness that allows men to get their bearings. Order is like a guiding path that makes sense out of the surrounding disorder of the wilderness. Indeed, there are few things more terrifying than the sensation of complete chaos. There are few things more reassuring than the warm security of order. The book, Return to Order, affirms that something is wrong with our society and its economy. Specifically, a factor of disorder has entered our economy and thrown our whole society out of balance. As a result, much is not working as it used to. The nation is polarized and disoriented. The consensus of our American way of life seems to be breaking down and unraveling. A sensation of disorder pervades everywhere. 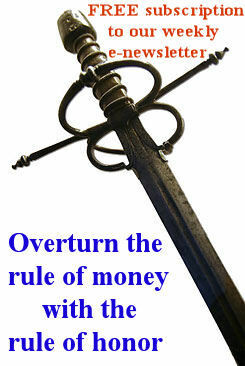 In face of the present economic crisis, we propose the solution of a return to order. That is to say, we need to return to a state of things where economy does what it is supposed to be doing; money serves the purpose for which it is created; and trade and commerce function in accordance with their ends. Likewise, society should work in function of the common good. All its institutions—the family, parish, community, and nation should form a natural framework that favors the common good and facilitates the practice of virtue. What is missing today is that primary need of the soul and the nation—order. 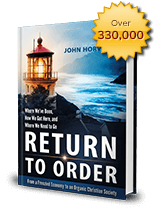 Return to Order is an analysis of where we have gone wrong especially in our economy. It is an invitation to join the national debate over our future course by exploring the nature of the order we need and the means by which it might return. This entry was posted in Featured and tagged Order, organic Christian society, Return to Order by John Horvat II. Bookmark the permalink.